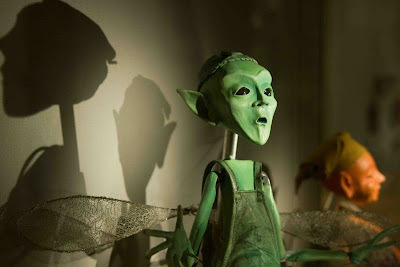 An exhibition is currently showing at the Royal Opera House in Covent garden, titled Sylphides and Faeries. Well I know what a fairy is but what is a sylphide? A short ballet with no story but dancers in white, sylph like creatures, dancing in moonlight. (according to wikipedia). So puppets, beautiful costumes and lithographs are all on view. I also learned that La Sylphide was the first ballet that had ballerinas balance on their toes for most of the production. I enjoy being educated here. The light in this photograph is really beautiful and I like the expression in the face. What a fantastic shot! I really love it! Well done! Interesting. I have learned something new today! And, I LOVE the Royal Opera House! I know the guys who work backstage, so whenever I am there, I try to stop in and say hello. The first time I was there, I got a tour of the building from top to bottom! It was fantastic! This is a striking photo, just because of its uniqueness. Very cool! A very nice "portrait", however obviously not of the sylphide, who should be some kind of ideal beautiful woman - I believe! Do you have some other photos available? :-) Have a nice weekend! Beautiful creature in its own way. Fragile and elegant. Appeals to the imagination. A beautiful shot, Mo. Perfectly captured and so fascinating. Lovely shot, Mo, although the green being looks like something between start trek, et and shrek (for the colour at least!). Have a nice weekend. Ciao. A. Thanks for stopping at my blog. I appreciate your comments. I had no idea what a young or diminutive sylph is so looked it up and still don't know. Duh. I must be missing something. I do like your photo and the light and shadows. This is a cute looking thing, if a bit scary. I like the shadows in the photo. The puppet is beautiful !